It’s the last day of September and, although we expect storms on Mallorca this month – after the long hot summer – we seem to have had more of them than usual. And along with high temperatures, the high humidity has made things uncomfortable at times. We’ve also had three lots of visitors staying with us during September. The first visit was from our friends Duncan and Kristina, who were surprised to find it so hot and humid – having stayed at the finca with us before at around this time. During their stay, we spent the best part of one day with them in the lovely coastal village of Banyalbufar (enjoying an excellent lunch at 1661 Cuina de Banyalbufar – a most-visit restaurant if you’re ever in that part of the Mallorca). The sun had shone all day and was still shining as we approached home. One thing was evident though: puddles were everywhere. Clearly it had rained, but stopped in time to give us a warm and sunny end to the day. The weather, in our absence, turned out to have been more than a heavy shower. As we drove through the gates onto our drive, we noticed that the dishes under all the flowerpots were full of water. That was the only sign there that there’d been a storm. But when we opened the shutters at the back of the house, all was revealed: two teak dining chairs blown over; a parasol (on a stand) lying on the ground, and another parasol broken and blown some distance from its original position. 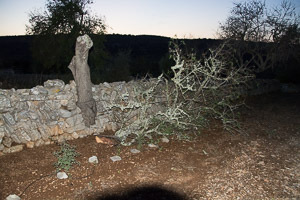 And down in our field, two almond trees had suffered severe damage. We now have a couple of almond tree trunks standing forlorn and without branches and leaves. We found out later that there had been an intense hailstorm, with severe winds. 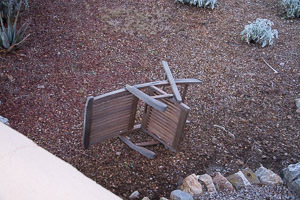 It seemed that a mini-tornado had whipped its way through our garden, leaving its calling card in its wake. 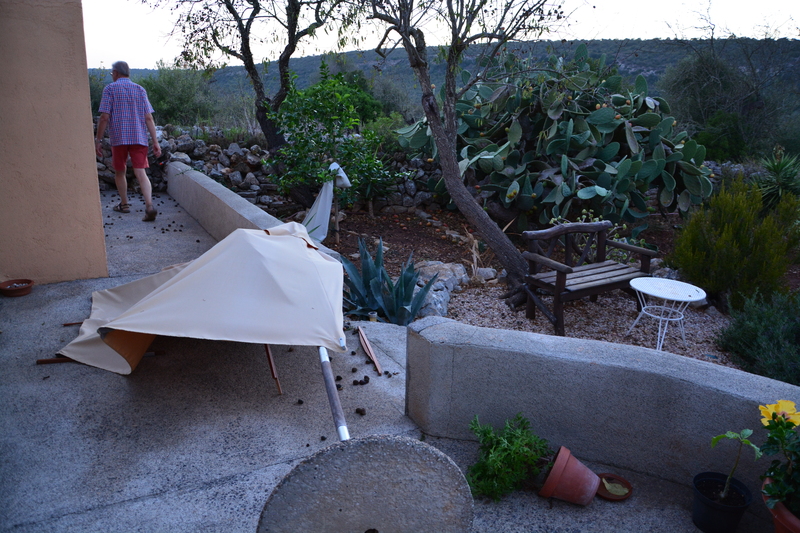 We checked out our Swiss neighbours’ garden (in their absence) as it appeared to be on the trajectory of whatever had passed through our garden, but the only damage suffered there was a potted plant that had been blown over. 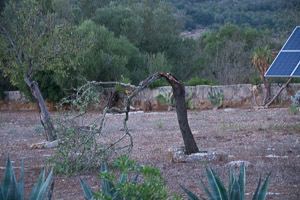 This was a very localized storm, and there have been quite a few of those on Mallorca over the past few weeks. Every day we’ve checked various weather apps, finding the forecast of more storms. Our visitors this September have not had quite the weather they’d expected. We’ve now had enough rain (hopefully) to top up the reservoirs depleted during the summer months. Mallorca is looking green again, with an enthusiastic showing of early weeds in our garden. But the most unexpected sight in our garden – due no doubt to the continuing warmth and all the rainfall – has been almond blossom on one of our several trees (undamaged by the storm). We don’t usually see that until January/February. It’s been a strange September . . .
All photos courtesy of Duncan Matthews. 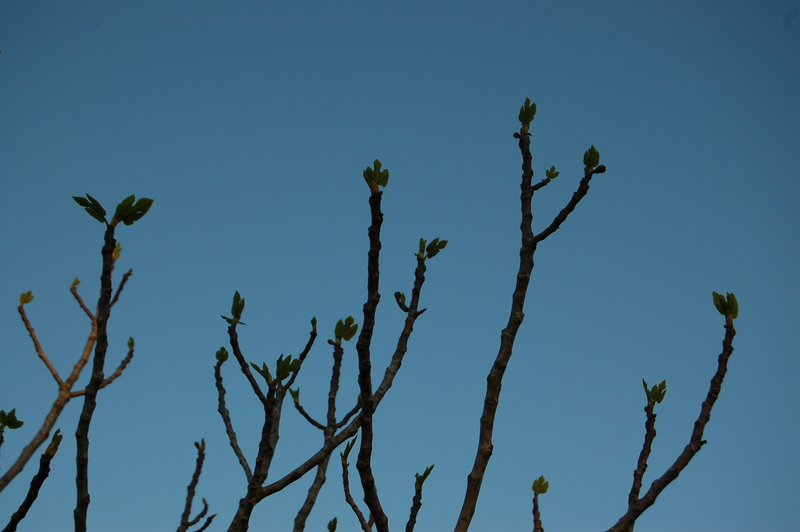 You know it’s spring on Mallorca when . . .
. . . the first of the fig leaves emerge on the trees. Don’t they look like little green butterflies resting for a while?
. . . your shoulders and back ache from all the weeding you thought wouldn’t be necessary after having laid a special membrane to stop weeds growing.
. . . you have to be careful not to tread on a tortoise when walking in the undergrowth.
. . . your arms look and feel like pincushions after trimming all the agaves and sword-like plants.
. . . the birds start checking out nesting sites in the old almond tree in the field (the one the cats like to climb).
. . . the warm sunshine that bathed the island in the final weeks of winter is replaced by grey skies, cool temperatures and drizzle! They often give us fruit and vegetables they’ve grown. On one occasion, while I was out for a walk and passed the finca of Toni and Maria, they came out and presented me with the world’s largest watermelon. So enormous was this magnificent fruit, that I had to carry it up the hill, pressed against my stomach and supported by both arms. By the time I staggered through the gates at home, I had an inkling how it must feel to be heavily pregnant . . .
They’re generous about sharing their knowledge and advice – on occasions, unsolicited. The Boss was once up a ladder, giving our almonds trees a long-overdue pruning – not something of which he’d had a lot of experience. Pedro stopped while driving past our finca to tell him where he was going wrong . . .
They’re very honest. One day we were talking – in castellano – to a local couple who farm in the valley and sometimes stop for a chat when they’re passing. “You’re like a real Mallorcan now,” Margarita told me. I puffed out my chest in pride – my Spanish was obviously improving. “Yes,” she reiterated. “Just like a Mallorcan woman!” And with that she patted my tummy . . . a reference to the fact that quite a few Mallorcans carry just a little bit too much weight around the middle. Brutally honest. They’ve never invited us to a matanza. We’ve been invited into the homes of several Mallorcans for meals and various social occasions, but thankfully we’ve never been invited to a matanza – the slaughter and butchering of the family pig(s). This traditional event, which takes place around this time of year at farms and rural homes all over the island, is one I’d rather not witness, thank you. It’s an occasion for family and friends to gather and join in with the messy business of turning a perky pig into a pantry (or freezer) full of porky products for the coming months. The thought of being elbow deep in a large vat of squidgy pig bits is not for the squeamish . . . and certainly not for me. It’s for the matanza that our local supermarket has stocked up with the necessary accessories (string, paprika and a white powder that prevents rancidity) for turning Peppa the Pig (don’t let your little ones read this) into Mallorcan delicacies such as llonganissa, botifarró, and sobrassada – a well-hung cured pork product flavoured with a generous quantity of paprika. Sobrassada is emblematic of the island and adds great flavour when used in cooked dishes. It’s also popular spread thickly on rustic bread but, personally, I’d prefer a well-made crispy bacon sandwich. If only I could find one on Mallorca . 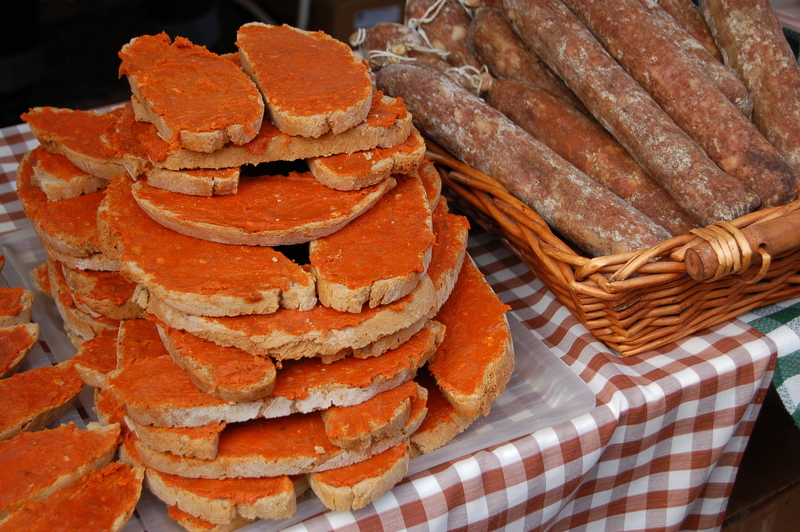 . .
Sobrassada spread on rustic bread – a popular Mallorcan snack.